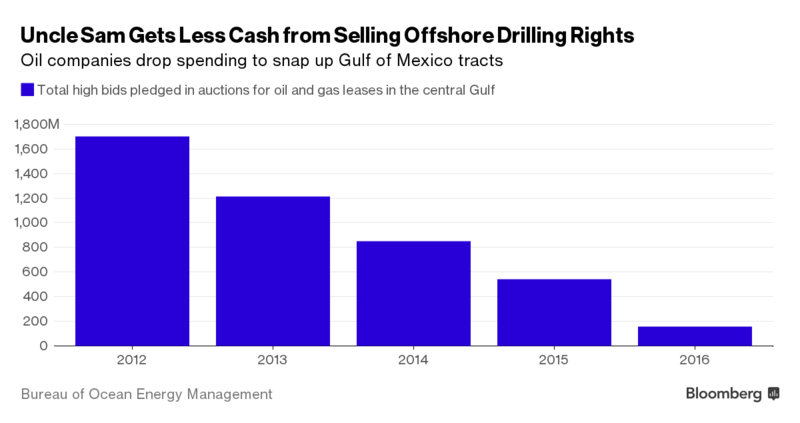 Will proposed oil drilling rules cut coastal cash? The Well Control Rule: Safer or Just More Costly? Cheap oil may be a boon to U.S. motorists who are paying less at the pump, but it’s costing the federal government hundreds of millions of dollars in revenue. Just 30 companies showed up for a government auction of offshore oil and gas leases on Wednesday, plunking down $156 million in high bids for once-coveted territory in the central Gulf of Mexico. When the same auction was held three years ago against the backdrop of $92-per-barrel oil, the government’s take was nearly eight times larger: $1.2 billion. The money oil and gas companies paid in bids, rental payments and royalties for work on federal land and in U.S. waters — about $8.7 billion in the fiscal year ending Oct. 1, 2015, according to the Interior Department — ultimately flows into the general fund of the treasury, and then is spent on other programs. States such as Alaska and Texas, whose budgets are deeply tied to the oil industry, have already felt the pinch since gas and crude prices began falling in 2014. In Alaska, where oil money flows to every resident in the form of an annual dividend check, declining production and revenue even has lawmakers mulling something once considered impossible: an income tax to help meet projected budget shortfalls. The situation is nowhere near as dire for the U.S. government, where revenue tied to taxes, royalties and other payments from the oil and gas industry is just a sliver of the annual budget. But the U.S. government will still take a hit — with the spillover possibly affecting conservation programs funded by offshore oil money and making it harder for lawmakers to assemble a federal budget. There probably will be a decline in federal revenue tied to oil and gas activity in the United States, “unless you see a dramatic turnaround in recent trends,” said Bloomberg Intelligence analyst Rob Barnett. Already, royalties charged on oil and gas extracted from federal land dropped by about 40 percent between 2013 and 2015, he said. Of course the federal government is also a significant consumer of energy, so price declines help on the expense side of the ledger. Royalties, which are paid as a percentage of the value of oil and gas extracted from federal lands and waters, are just a portion of the money the U.S. government collects from the activity. The federal treasury also collects taxes, rental payments and bids, which are the amounts paid by oil and gas companies to nab tracts at government auctions. After income taxes, leasing activity and royalty payments from the energy industry are the largest contributor to federal revenue, according to the Gulf Economic Survival Team and the American Petroleum Institute. Even so, revenue from oil, gas and coal extraction on federal lands and waters was about 0.4 percent of the $3.4 trillion in total revenue collected by the federal government in fiscal 2015, according to the Interior Department. Industry officials say falling revenues should prompt the U.S. government to open up more territory for oil and gas development. LeBlanc says the declines show the importance of taking “a prudent and systematic approach” to developing new regulations that govern drilling, including an offshore well control rule expected to be finalized within weeks. Under the Obama administration’s proposed plan for selling offshore oil and gas leases from 2017 to 2022, companies would largely be confined to waters around Alaska and in the long-plumbed Gulf of Mexico. None of those changes are likely in coming months, Barnett said. “Many Republican lawmakers would like to see greater access to federal land and more frequent lease auctions, but while President Barack Obama is in office, such ideas aren’t likely to materialize,” he said. The total high bids pledged at Wednesday’s auction in New Orleans is the fourth-lowest for any central Gulf of Mexico sale, according to the Bureau of Ocean Energy Management that led the proceedings. And the 148 sealed bids filed with the agency was the lowest collected in a central Gulf sale going back two decades. The decline in activity reflects current market conditions and comes amid soaring Gulf production on leases sold many years — sometimes decades — ago, industry and government officials said. “Companies just don’t have that kind of cash right now,” said Randall Luthi, a former drilling regulator who heads the National Ocean Industries Association. Fears about future regulations also were a factor, he said. Cheap oil may be a boon to U.S. motorists who are paying less at the pump, but it’s costing the federal government hundreds of millions of dollars as bids fall for offshore oil and gas leases. The money energy companies paid in bids, rental payments and royalties for work on federal land and in U.S. waters totalled about $8.7 billion in the fiscal year ending Oct. 1, 2015 but is likely to fall. Are you Gulf Proud? Do you or members of your family work in the Gulf energy industry? Why is Gulf energy important to you and to America? Join the Hard Hat Crew!